For A Billionaire, $2M Gets You Superdonor Status After winning the 1992 America's Cup race, Bill Koch — the brother of billionaire industrialists David and Charles — treated all 260-plus people on the team, plus their families, to a trip to Hawaii. Now, the lesser known Koch brother has entered the presidential derby big leagues with a $2 million donation to the superPAC supporting Mitt Romney. 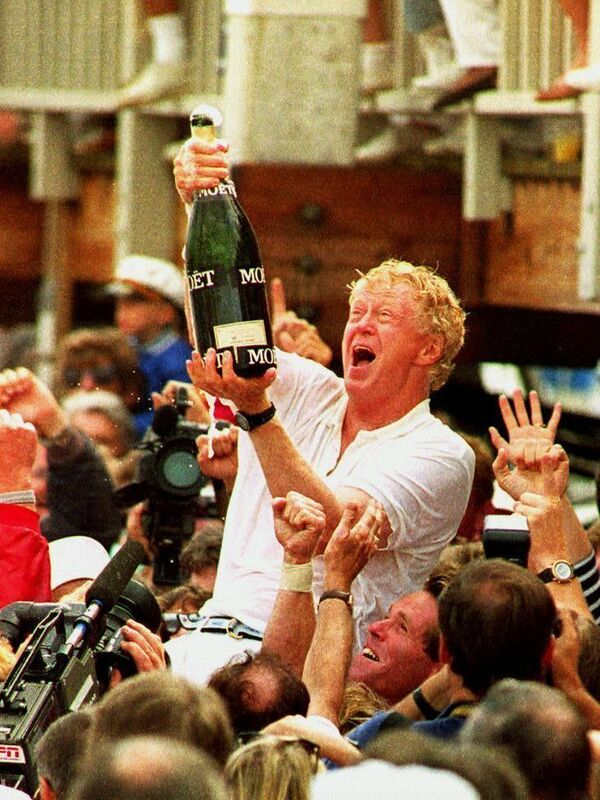 Bill Koch (center) celebrates his team's 1992 America's Cup win. Koch, the brother of billionaire GOP donors Charles and David, has given $2 million to the superPAC backing Mitt Romney. In the world of high-dollar politics, the billionaire industrialists David and Charles Koch are famous for their lavish funding of conservative politicians and causes. But there's another Koch brother — William — who is passionate about many things, but only recently about politics. Bill Koch is an avid yachtsman, and he set out to win the 1992 America's Cup. It would take four boats, more than 260 team members and single-minded determination. David Rosow was the team's business manager and is a longtime friend of Koch's. Shortly before the final series of races, the team captain announced that he would delay the next day's 6 a.m. workout. Team members expected to be out late at the black-tie America's Cup Ball. "Bill looked up," recalls Rosow, "and said: 'Here's the situation. We're here to win the America's Cup, not to dance at the ball. I will take you all — I'll take the entire team anywhere in the world you want to go, when we win. But anybody who goes to the ball tonight is off the team.' "
And after they did win, says Rosow, "he took all 260-plus people, plus their families, to Hawaii for three days. Everything was free, and everybody just could not believe the experience they just had." In a documentary for ESPN, Koch later said the America's Cup victory cost him $68 million. "Financially, I would say win or lose, it's not worth it," he said. "If you asked me ... if I knew what I know now, would I do it, the answer to that would be no." Bill Koch's fortune is $4 billion according to Forbes magazine. His twin brother, David, and older brother Charles have about $25 billion each. It all started in Koch Industries, the energy conglomerate founded by their father. But in the 1980s, David and Charles bought out Bill and a fourth brother, Frederick. Bill sued, igniting a bitter feud that ran nearly two decades. On the night the suit was settled, Rosow says, Bill Koch told him to come over for dinner. The toll of the fight became evident. "Bill was ebullient," says Rosow. "He cried. And he passed out from exhaustion." Away from the family business, Bill Koch built his own company, Oxbow Carbon. Its main product is calcined petroleum coke, an essential ingredient in producing aluminum. He later had Oxbow lobby against Cape Wind, a wind farm proposed for Nantucket Sound off Cape Cod, where he has a home. Brad Goldstein, a spokesman for Koch, says it's not just that the offshore wind turbines would be ugly. "We did the economics on Cape Wind, and we felt that it was economically unfeasible. We still believe that today," Goldstein says. Mark Rodgers is a spokesman for the Cape Wind project. "He certainly has placed himself, I think, in a higher visibility role in opposing the project than maybe some other big donors, who preferred to remain more secret," Rodgers says. But it's Bill Koch's collecting that keeps him in the news. He has a huge art collection and 40,000 bottles of wine. A few years ago, he sued a dealer who sold him some wine that supposedly had belonged to Thomas Jefferson. Benjamin Wallace wrote a book about the ongoing dispute, called The Billionaire's Vinegar. "There are very few very wealthy wine collectors who are willing to ever stand up and admit that they were duped, and then spend millions of dollars of their own money to try to hold people accountable," Wallace says. But one thing Koch hasn't thrown himself into is politics. He's given small amounts to many politicians, and $300,000 to the Democratic National Committee a dozen or so years ago. In 2008, Republican nominee John McCain's campaign listed Koch as one of its big fundraisers. Goldstein says Koch's involvement now is with Mitt Romney, not with the Republican Party. "He has a personal relationship with Mitt, that goes back to when Bill Koch was in Massachusetts, and that was back in the '80s," Goldstein says. Goldstein says that Koch likes Romney's policies on free trade. "And he believes that Mitt supports individual liberties, and he feels that the current administration is encroaching on individual liberties by instituting too many regulations," Goldstein says. Koch is on the Romney campaign's Florida fundraising team, and he has given $2 million to the pro-Romney superPAC Restore our Future. Only 10 Americans have contributed $2 million or more to superPACs in this election cycle. But that amount of money can look different in Koch's world. A year ago, Koch was at an auction of Old West artifacts, something else he collects with a passion; he was there to bring home the only known photograph of Billy the Kid. For $2 million, Koch got his Billy the Kid. The auction took all of 2 1/2 minutes.